If you’ve invested in expensive electronics, then it makes sense to store them in a manner that prolongs their usability. Unfortunately, these electronics can’t just be stacked on a shelf if you want to get the most out of them. 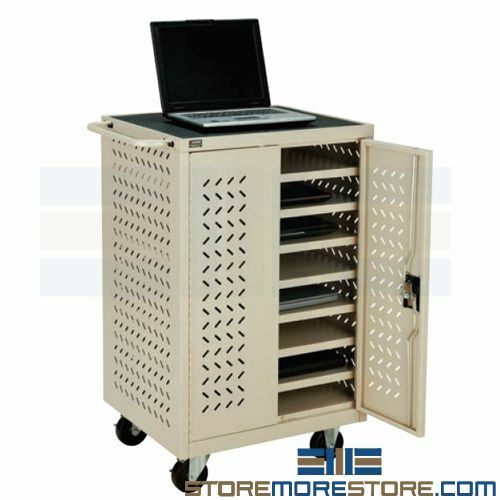 Laptop charging carts are a great solution not only because they keep electronics like Chromebooks, iPads, and tablets charged and ready to go, but they also keep them stored safely and securely so you don’t have to worry. Improper ventilation causes electronics to overheat, which lessens their life and functionality. Because of this, the laptop carts feature ventilated sides, panels, and doors to allow sufficient airflow and keep stored items cool. User safety is one of the first considerations of any product, but this is especially true with electronics. 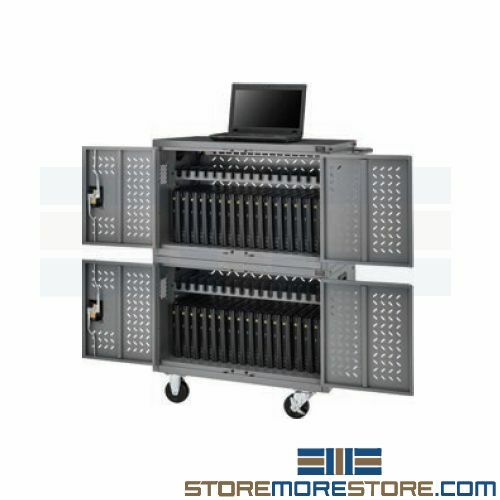 With the laptop charging carts, you don’t need to worry about surges or electrical output. It’s also easy to overlook how cable management factors into safety measures. But with disorganized and scattered wires, tripping hazards or malfunctions can turn into serious accidents. The laptop charging carts come with cable management features that keep wires stored safely and neatly. This also prevents chargers from being bent or folded, which reduces their lifespan. Additionally, the rear doors open for easy access to cables. Obviously, you want to keep your expensive electronics secure from theft. With channel reinforced steel doors and a 3-point locking system, the charging carts ensure that all devices are protected at all times. Durable casters roll easily so you can quickly transport electronics where you need them. Two swivel and two rigid brakes make it easy to transport the cart around corners. Laptop charging carts are available to buy online and ship in 5-7 business days with free dock-to-dock shipping included. If you need any assistance or just want some help picking the right solution for you, please call us at 1-855-786-7667.